Wuthering Heights was Emily Brontë’s only novel. The ill-fated (some would add, twisted) relationship between Heathcliff and Cathy shocked readers when the book came out. Today, the story about the lovers on the English moor is so well known, it’s iconic. 1. Emily Brontë Grew Up On The Moors. Emily spent most of her life in Haworth, Yorkshire with her siblings Charlotte, Anne, and Branwell. She was a recluse and had few friends other than her family. At the time, the back door of her father’s parsonage opened onto the moors. Emily, a nature-lover, was intimately familiar with this wild landscape, which she depicted in Wuthering Heights. Today you can walk many of the places mentioned in the novel. 2. The Setting Might have been Inspired By A Real Farmhouse. Emily may have based the farmhouse Wuthering Heights on a real place named Top Withens. Although Top Withens is now a ruin, when Emily was alive, it was a working farmhouse. Originally called “Top of th’Withens,” it's located on an isolated, windswept hill overlooking the valley. While some of Wuthering Heights’s architectural details are closer to nearby High Sunderland Hall, Top Withens is accepted as the inspiration for the house in the book. It's now a well-known tourist destination. 3. The Book Was Self-Published. 4. Hindley Earnshaw Was Similar To Branwell. 5. Wuthering Heights Is Not A Romance Novel. People tend to think of Wuthering Heights as a romance. It was even voted the greatest love story of all time. But the book is closer to a gothic novel than a romance. For one thing, the love story between Heathcliff and Cathy only takes up half the book. The second half is about what happens after Cathy’s death, which involves her daughter, Hareton, and Linton. In addition, Heathcliff is not a romantic hero, but an obsessive abuser. His relationship with Cathy is sometimes disturbing—for example, he breaks the side of her coffin so that, when he dies, they can decompose together. Clearly, this guy has issues. 6. The Book Was Panned By Critics. 7. Emily Died Thinking The Book Was A Failure. Wuthering Heights came out in December 1847. A year later, in December 1848, Emily died at age 30 from tuberculosis. Her brother Branwell had died in September and Anne would soon follow in May 1849, leaving only Charlotte alive. Emily would never know that she’d written a book that would become a classic of English literature. 8. Charlotte Bronte Shaped How Emily Was Perceived. In 1850, Charlotte put out a revised edition of Wuthering Heights and Agnes Grey. Along with removing typos and altering the Yorkshire dialect, Charlotte wrote a preface that revealed all three of them to be women writers. She also tackled some of the criticisms of Emily. Among other things, she blamed the wild nature of the novel on Emily’s rural upbringing in Yorkshire, painting her as a "nursling of the moors." She also suggested that Emily didn’t know what she was doing when she was writing, for she had a creative gift that "strangely wills and works for itself." The new edition turned critical perception to the Brontes’s side, but also created myths about Emily that still persist. 9. Wuthering Heights Has Been Adapted Many Times. Film adaptations range from a 1920 silent film—now lost—to the 1939 version starring Laurence Olivier to the 2011 version featuring black actor James Howson as Heathcliff. Since the novel is an international sensation, it has been adapted by other cultures as well, such as the 1966 Hindi film Dil Diya Dard Liya, (watch here) or the 1988 Japanese movie Arashi Ga Oka (watch here). Other recreations include musicals, ballet, opera, and the recent TV movie Wuthering High School. 10. Wuthering Heights Inspires Other Artists Too. 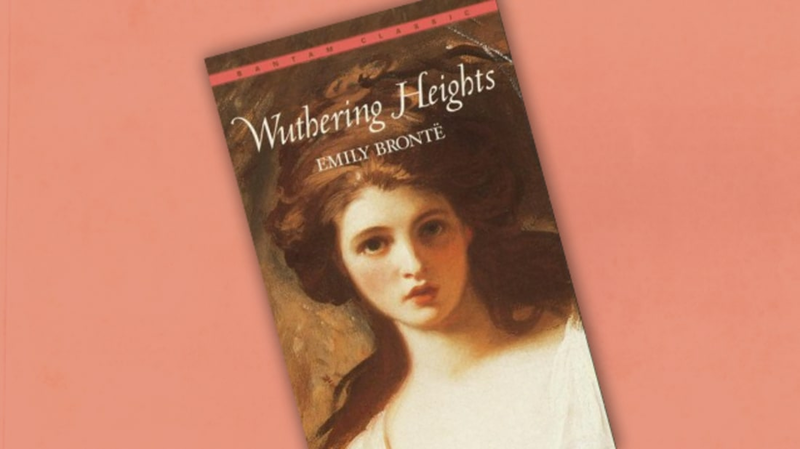 Many have used Wuthering Heights in their own work. Sylvia Plath wrote the poem “Wuthering Heights” about visiting Top Withens. In turn, her husband Ted Hughes wrote a poem about her writing that poem. The story of Wuthering Heights has been re-imagined in other novels, such as Windward Heights by Maryse Condé, which is set in Cuba and Guadaloupe. The book has also inspired paintings, graphic novels, and a Monty Python skit. There’s even a roleplaying game.